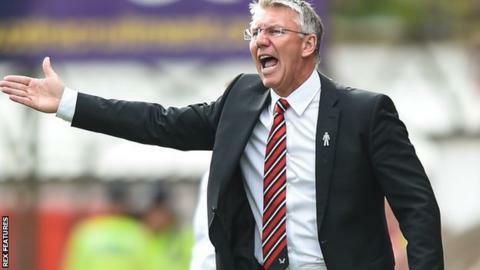 Sheffield United boss Nigel Adkins has said the team must improve after stretching their winless run in the league to five games. A section of the home support turned on the players during the 4-2 home defeat by Shrewsbury on Tuesday. The Blades are currently 12th in League One, five points outside the play-offs. "We are not where we want to be. We can't keep doing what we have been because we have to win games of football," he told BBC Radio Sheffield. "I have got to be very demanding and ruthless, but I have to make sure that we have the opportunity to win. "The players will be given clearly defined roles and responsibilities when they go out on to the pitch on Saturday, but once they cross the white. line the energy, passion and desire has to come from them." The Blades visit struggling neighbours Barnsley on Saturday. Adkins replaced Nigel Clough in the summer after the Bramall Lane side missed out on promotion through the play-offs for the third time in four seasons. The former Southampton and Reading boss denied that the job has proved to be tougher than he expected. "It's a great challenge and nothing worth achieving is easy," he said. "I want to be at the top echelons and winning things, pressure comes with that and you should embrace it. "This is a top-level football club and there are demands that come with that, but you should be excited by that. "Obstacles are placed in your way but that brings opportunity."